Star Wars fans have launched a petition to have The Last Jedi removed from the franchise's canon. The petition, posted to Change.org, has earned merely 1,800 signatures by the time of publishing but each came within a day of the petition's launch by Georgia native Henry Walsh. As the awareness spreads, the signatures may climb if fans of the Episode VIII leave theaters unsatisfied. Walsh loaded the petition's description with spoilers for Rian Johnson's The Last Jedi. 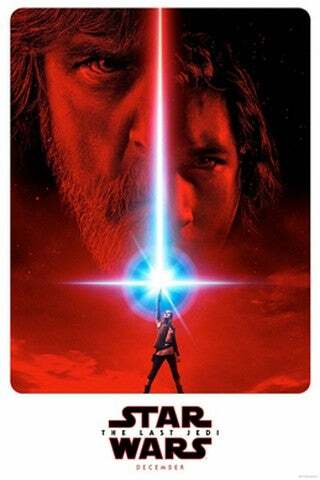 "Star Wars has long been a story about two things, the Jedi and Luke Skywalker," Walsh wrote. "After over 260 novels where we could follow the adventures of that great hero you, the Walt Disney Company decided to strike all of that from the official canon and wiped out three decades of lore. We were excited to see Episode VII to see how our heroes lives turned out since you took away what we knew. We saw the death of Han Solo, we saw less than a minute of Luke Skywalker." Clearly a fan of Mark Hamill's character, Walsh was infuriated to see the creative decisions for Luke in the latest film, prompting the word "travesty" in his review. "It completely destroyed the legacy of Luke Skywalker and the Jedi," Walsh wrote. "It destroyed the very reasons most of us, as fans, liked Star Wars. This can be fixed. Just as you wiped out 30 years of stories, we ask you to wipe out one more, the Last Jedi. Remove it from canon, push back Episode IX and re-make Episode VIII properly to redeem Luke Skywalker's legacy, integrity, and character. "We stuck by you when you did things that hurt us before, so we ask you now, please don't let this film stand," Walsh said. Don't do this to us. Don't take something so many of us loved so much and destroy it like this. Let us keep our heroes." There has been no comment from Disney, Lucasfilm, or filmmakers regarding any petitions. Nor has any movie or TV show ever changed creative decisions or character deaths as a result of signature accumulations. Jericho, however, did get a second season when thousands of fans begged TNT for one more.